Menopause can come accompanied by a range of psychological symptoms as well as the commonly-known physical ones, and one of the main psychological effects is a tendency towards anxiety and mood swings. This can make menopause very hard to live with, and many women find that the change in mood makes it hard to stay levelheaded. However, despite adverse psychological effects being a common part of menopause, they do not have to be inevitable. Keep reading for advice on how to stay levelheaded during menopause. Why Is it Hard to Stay Levelheaded? Erratic hormone levels have a large part to play in mood, and this is especially true of estrogen. As the level of this hormone rises and falls, a woman can find that her sense of well-being can plummet and normal temperament is disrupted. Having to deal with the anxiety and embarrassment of other menopausal symptoms, such as hot flashes, vaginal dryness, and sleep problems, can lower a woman's mood and make menopause a difficult time. A further reason it is hard to stay levelheaded during menopause is that this time of life can coincide with big and stressful life events. For example, this is often the time a woman will have to deal with ailing parents, children leaving home, and possibly the death of a spouse. Therefore, feeling positive is not always easy. Staying levelheaded and feeling sane in the midst of so many bodily and life changes can often seem an impossible task. However, there are things you can do to keep your head above water and not feel so overwhelmed by the whole experience. Lowering your stress response is the first step to clearing your head, and one of the best ways to do this is through practicing rhythmic breathing. Focusing solely on producing slow, conscious, and mindful breaths for around 10 - 15 minutes a day helps reduce heart rate, blood pressure, and respiration rate. These physical changes in your body result in a better sense of well-being and will clear your mind, leaving it free to think of solutions to possible problems instead of being overwhelmed by them. Regular exercise will also help reduce the amount of stress that can build up during menopause, and thus keep you levelheaded. With physical activity comes the production of endorphins, and this can increase sense of well-being and elevate mood. In addition, it can also reduce the effects of menopause symptoms, such as hot flashes, and this can lift mood if they are what is getting you down. Although incorporating things like exercise and rhythmic breathing into your life can be excellent long-term remedies against feeling low during menopause, it can sometimes help increase motivation if you take an herbal remedy to increase mood for a few weeks. Although valerian is not recommended to be taken for more than a few weeks at any one time, it naturally promotes relaxation, and could give you a kick-start. Keeping calm and reasonably positive during menopause is a difficult task for many women, but by implementing a few healthy lifestyle changes, such as those mentioned above, staying levelheaded will be a much easier task. 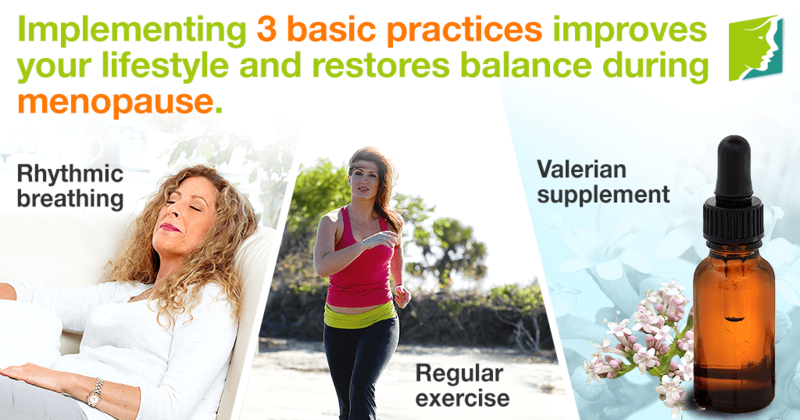 While hormonal imbalances are the main cause, there are ways to deal with menopause to maintain your lifestyle and restore balance.